I always go when it is low tide and i like to go in the mornings! This photo makes me feel happy and relaxed! I took this photo with my Sony Handycam Digital Video Camera. 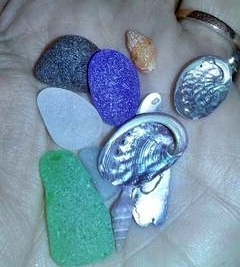 I like taking pictures of Seaglass in its natural setting and outdoors. That reminds us of the few times we were able to check out Cannery Row - nice small pieces we found but nothing like this blue!